I’m told children benefit from routine in their lives. A farm provides that in spades. Patterns of each day and each season repeat with a regular rhythm. Manu is such a keen helper he does not bother getting dressed before morning chores. He is the official taster for the chook food. He also enjoys tasting hammers. But seriously, he loves helping in anyway possible, even if it is just carrying something. If he only had more horsepower in that thing we could get some serious work done. Yesterday morning was spent doing two very mundane jobs: fencing and digging drains. Verti – almost four – spent the morning working with me and Wies, our current intern. Manu – just over one – spent the morning on my back and so he does not feature in any pictures below. For her, helping on the farm is normal. For us, it’s learning. As long as she is safe and not tormenting animals, it does not matter what she is doing. It’s all better than sitting in front of a screen. There is always a lot to do when practicing regenerative agriculture on a worn out horse property. But instead of the children getting in the way of getting work done, we try as much as possible to integrate them into the day-to-day workings on the farm, as well as with special events. Another one of Verti’s jobs is to welcome visitors onto the farm and give a little tour. Here she is with 17 teenage boys from Wanganui Collegiate School this week. We believe integrating the children with our work on the farm is all a part of instilling in them what is normal for a family: composting, cutting firewood, growing veges, raising hens, eating cockerels, and soon milking goats. The short answer is getting them outdoors as much as possible and away from screens of all types. That’s a start anyway. We celebrated our son Suleiman’s – aka Manu – birthday yesterday. The theme of the party was “Let’s make a mess.” (Manu is good at that.) The featured activity was the mud pit – aka farm pond partially completed. It’s amazing how much joy can be provided by clay and water. Fun was had by all. No Manu, it’s your 1st, not your 21st! Editor’s Note:This is another weekly column in the Wanganui Chronicle. I’d like to give the two of you my perspective on what the Zuckerbergs have set as their two priorities to improve the prospects for your generation: advancing human potential and promoting equality. cultivate attitudes of helping, sharing; and gratitude in children. I know that the two of you are decades away from becoming parents yourselves, but I need to get this stuff down while it’s fresh in my mind. What the world needs most is creative problem-solvers. If we wire that in from an early age it contributes to maximizing human potential in individuals and societies. That is the best win-win we can plan for. From what I understand, people are made of equal measures nature and nurture. It’s the same with garlic. 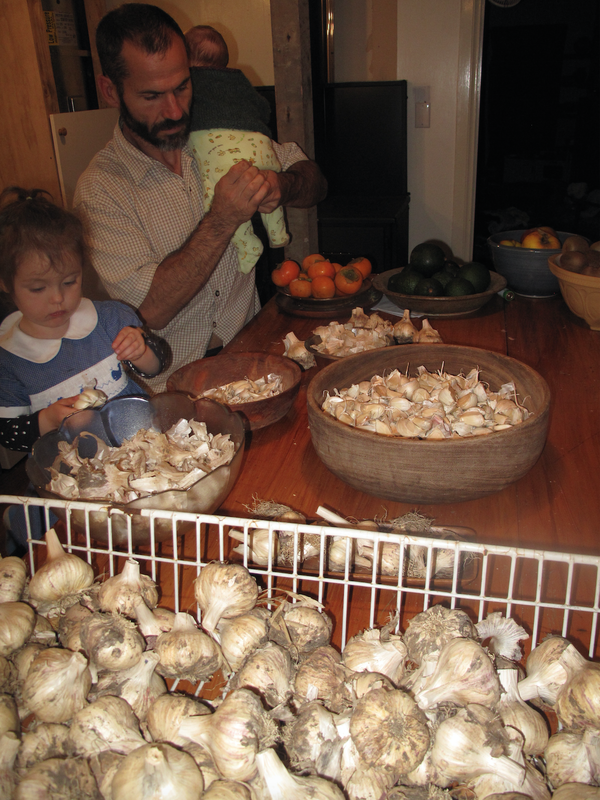 Growing great garlic starts with superior genetics, but that’s only half the game. An exceptional crop requires ample high quality compost, heavy mulch, good soil, regular watering, and pulling at just the right time. It is the same with growing great children, only with more compost and less mulch. Promoting equality is one of the major challenges of our time. Pope Francis himself has put it alongside climate change as the most pressing issue facing humanity. Sadly, both of these issues appear to suffer from an over abundance of personal opinion and an under abundance of research when politicians get involved. Our own community is exceptionally vulnerable to both, yet many of the decisions made by the local government make both issues worse. As economic inequality widens, we all suffer the consequences of increased social problems, crime, and violence alongside the negative effects of a depressed local economy. It’s literally a lose-lose for rich and poor alike, yet the trend locally is making things worse. It’s sad but true, but what can we do to fight the tide and promote equality? The first and most important thing is to get those people who do not vote to VOTE in every election, especially local elections. Politicians on every level do not speak to ‘the people’, they speak to ‘the voters’. There is a big difference when you look at economic inequality. Promoting equality also involves advocating for a capital gains tax and removing GST on fresh fruit and vege on the national level. Locally, it means lobbying councilors to reverse the regressive rates system that makes wealth inequality worse in our community while depressing local economic activity. Wouldn’t you think the Chamber of Commerce would be the first group beating this drum to the door of the council chambers? Yeah, me to, but this is where personal opinion gets in the way of robust research. Most people believe only what they want to believe and what fits their pre-existing perspective on the world. (Research, by the way, shows this quite clearly.) I reckon all we ‘little people’ can do is form robust arguments based on the best available data and findings, and set out to influence hearts and minds. Everyone is capable of change, and it is possible to change the grossly unequal world we occupy. But it will only happen one person, one voter, and one politician at a time. If you choose – Verti and Manu – to fight the tide of inequality yourselves, remember to take time out to enjoy the sunrises and sunsets, to smell the flowers, to catch a wave, to dance to Neil Diamond, and to get plenty of sleep. You’ll be in it for the long haul.